Many people come to visit the historical northern city of Chiang Mai, but never extend their visit to travel into the hills and mountains surrounding it. Even fewer visit the charming neighbouring cities of Nan, Lampang and Lamphun which have an even older history than Chiang Mai. In this blog we will give you a taste of cities and towns near Chiang Mai, that you can visit as a day trip, stopover, or long stay. Lamphun is a beautiful small city 26km from Chiang Mai. It was founded nearly 500 years before Chiang Mai so there are plenty of historical sights to see. Lamphun is one of Thailand’s oldest continuously occupied towns and was founded in 660 by Queen Chama Devi, the queen of an ancient kingdom predating the creation of Siam or even Sukhothai. The most important sight of Lamphun is the temple Wat Phra That Haripunjaya, which sits in a lovely location near the river, and was founded in the ninth century. Many people come here just for the day, but if you are in no hurry, this is a perfect spot to stop over and relax in for a few days as there is plenty to do and see. Thaton is a town near Chiang Mai and close to the Burmese border. The main draw for tourists to Thaton is that there is a river pier here where boats take you on a 4 hour trip to Chiang Rai. This riverboat trip is famous and offers stunning scenery along the route. Thaton is a quiet town without much tourism or nightlife, but is beautiful, friendly and surrounded by some amazing countryside. Thaton also has a large old temple on top of a mountain just outside the town. 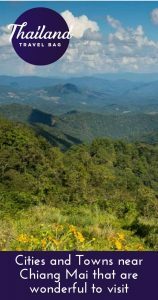 After an hour’s walk to the summit, you are rewarded with a gorgeous panoramic view of the surrounding beauty. Lampang is a charming small city near Chiang Mai that is famous for its horse-drawn carriages and home of the king’s stable of white elephants. Of all the cities and towns near Chiang Mai, Lampang has the most distinctive character. The rooster is a very old symbol of Lampang, derived from a local legend about a white rooster that was sent by the Brahmin God Indra to wake the locals so they could give alms to the Lord Buddha, who was travelling through the town. 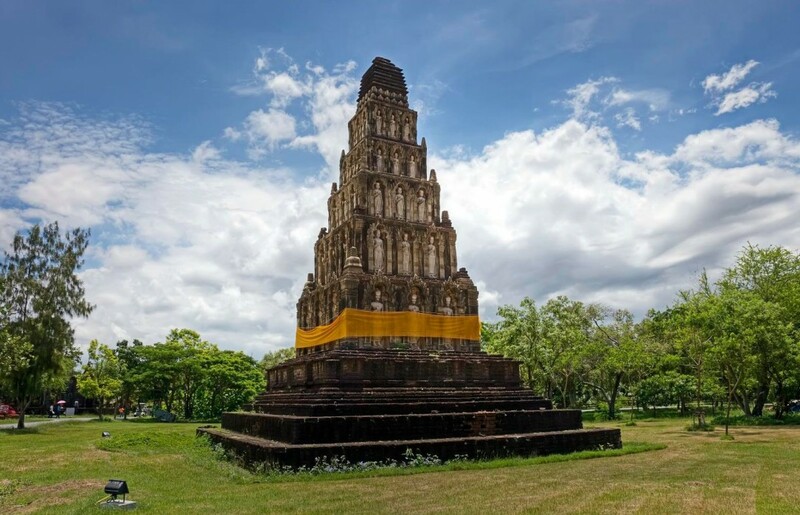 Since Lampang is more than 1,000 years old (older than Chiang Mai and Chiang Rai) it is rich in archaeological and historical sites from the kingdoms of Hariphunchai, Lanna, and Burma. There are also some nice riverside restaurants and a friendly local population. Just outside of the city, on the road to Chiang Mai, is the ‘Thailand Elephant Conservation Centre’ which is a famous government-run centre. Again, with places like this, please research thoroughly their reputation for animal care. Any centre that makes elephants perform tricks or take people onto their backs for rides are not elephant friendly according to WWF and many other animal welfare organisations. Chiang Rai is a relaxed city within the area famously known as the Golden Triangle. The Golden Triangle is where the borders of Thailand, Myanmar, and Laos converge. This area became synonymous with poppy growing and trafficking of opium back in the last centuries and has become romanticised in many people’s eyes. Chiang Rai is quite busy and full of tourists year round. It has many traditional Thai temples and also temples with a distinctly Burmese influence due to a long Burmese occupation of the area. There is also the famous White Temple one of the most distinctive temples in the world. The region is home to many hill tribes including the Akha, Lisu, Mien, and Hmong and Chiang Rai is famous for selling handicraft items such as fabric, wood-carvings and silverware produced by the hill tribe people. Doi Mae Salong Mountain is home to another traditional people who come from China and here you will find that Chinese is a commonly spoken language. Be careful in the area of Chiang Rai about participating in ‘hill tribe shows’ which are fake and exploitative. Mae Sariang is a rural non-touristic small town near Chiang Mai situated in a pretty green valley and surrounded by hill tribe villages and nature. Sitting on a largely undeveloped riverside and surrounded by forested hills and rice paddies, the town still has many old teak buildings, some Burmese and Shan style Buddhist temples and is authentic in almost every aspect. There are far fewer tourists in Mae Sariang than Pai, Chiang Rai, or Chiang Mai so you will also get a much more authentic experience of hill tribe life in this area. For instance, there are no “hill tribe shows”. Despite being less touristic, there are some nice hotels and guest houses here, so it really is a win-win experience. Nan is the former capital of an ancient small kingdom and is filled with history and surrounded by mountains, perfect for trekking. Nestled in Thailand’s northeastern corner, on the border with Laos, Nan is a remote small city to be explored at your leisure. Because of its proximity to Luang Prabang, (the historical capital of the Laotian Lan Xang Kingdom), the earliest settlers in the area were Lan Xang’s Laotians. 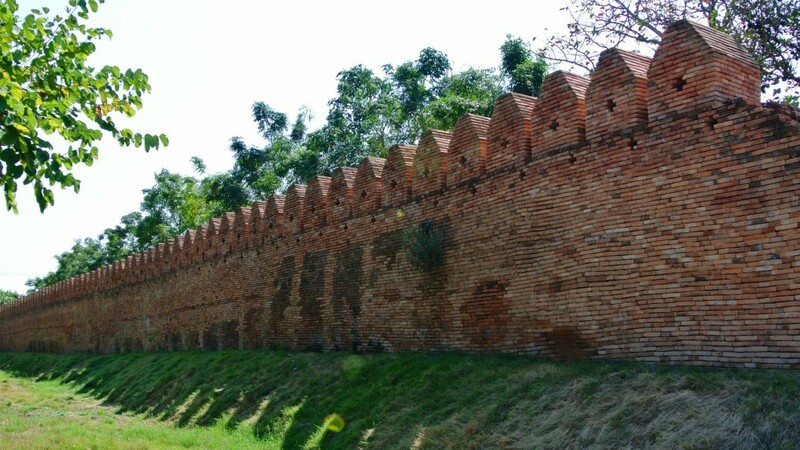 After that in the 13th Century, the King of Nan aligned himself with the Lanna Kingdom. 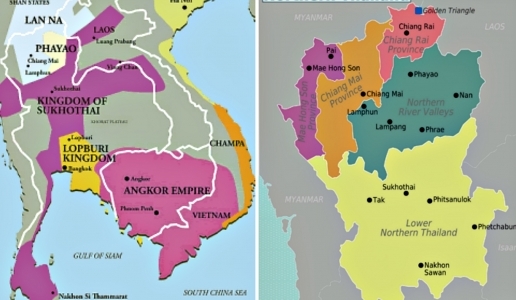 Nan’s ethnic groups are another highlight and differ from those in other northern provinces. The main hill tribes are Mien, Hmong, Thai Lü, Mabri, Htin, and Khamu. Nan province also has six national parks, including the Doi Phukha National Park, which contains mountains nearly 2,000 metres high. These parks are filled with awesome natural beauty and are much less touristic than the areas closer to Chiang Mai, Pai and Chiang Mai. Mae Hong Son is a remote and very pretty little town set in a mountainous valley with a strong Shan influence who make up the majority of the population. The Shan used to be rulers of a vast kingdom, have their own language and own ethnic tribes within their own culture. There are thought to be around 5 million Shan people in the world, and many of them live in this area of Thailand and still live by their traditional culture which originated in Southern China and they traveled south around 1,500 years ago. Mae Hong Son has a border town feel and is a real experience. It is not totally cut off from the rest of the world though and has been hosting tourists for many years who come to take boat trips and go trekking in the gorgeous mountains, which are actually the foothills of the Himalayas. If you come here in the cool season, you will need to wear a sweater in the evenings. Pai is a beautiful little town near Chiang Mai. Set in a stunning valley surrounded by nature, Pai has become a tourist town, offering a relaxed atmosphere with a broad traveller and backpacker scene. There’s plenty of budget accommodation and places to study yoga, eat vegetarian food and view the nature. Whilst Pai has become very touristic and even boasts a small airport now, it is still full of charm, friendly locals, peace and quiet and is surrounded by nature. Since it is nestled into the foothills of the Himalayas, expect cool nights and wonderful views. And finally, the Mae Hong Son Loop! Not exactly in the category of cities and towns near Chiang Mai, but it’s in the area, and is an awesome experiene. 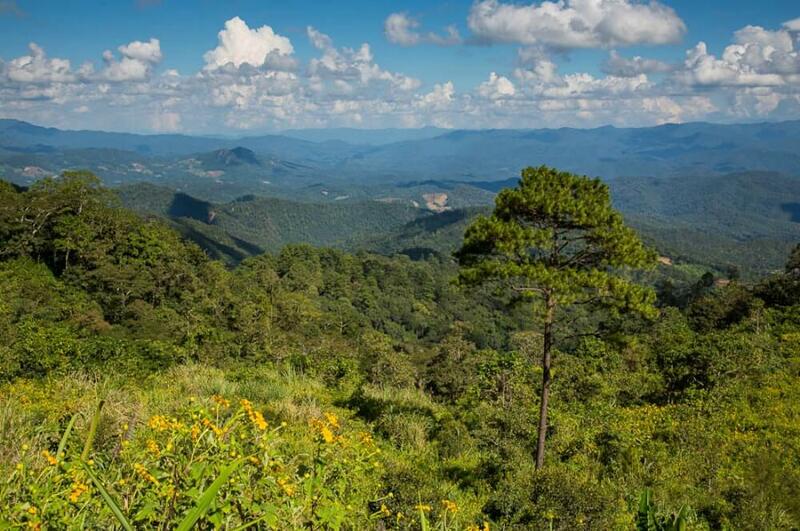 Northwest Thailand is home to one of the most spectacular sealed road loops in the world: the Mae Hong Son. It’s especially well-known amongst motorcycle tourers as it features over 4000 bends, taking you up and over mountains, through forests and across bridges for its entire 660km length. Apparently, you climb the equivalent of Mt Everest one-and-a-half times. The trip starts in Chiang Mai then makes a loop through Mae Sariang, Mae Hong Son, Pai and finishes back in Chiang Mai. That’s it for this blog. We hope it has given you some ideas for your travels and is some good advice for visiting cities and towns near Chiang Mai. Good Luck!